This recipe for Kalamata Olive Bread is one of my favorites – and as a bread fiend, that’s saying something! Over the holiday weekend I was craving it something awful, so Shane was nice enough to make me a loaf in the midst of our poster-hanging frenzy. (Yeah, we’ve only lived here three years, and already we’re getting around to decorating. WE MOVE FAST, YO!) Then I started craving pizza (like I ever stop! 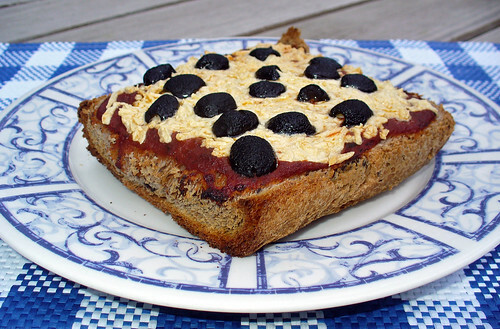 ), so I decided to combine my two loves to make Kalamata Olive Bread Pizza. It did not disappoint! The tang of the bread complements the mozzarella Daiya and red sauce nicely, and it’s even better when toasted to a lovely brown crisp. I see many more slices in my future. Of course, you can sub in your own favorite bread recipe; I’ve made quickie toaster pizzas with everything from homemade loafs to french bread to plain old sliced white bread. It’s hard to go wrong when vegan pizza is involved! The pizza toppings of your choice. I used red sauce, mozzarella Daiya cheese and black olives. 1. Set up your bread machine. 2. Place ingredients into the bread pan in the following order: water, olive oil, olives, bread flour, sugar and salt. 3. With your finger, make a small indentation on one side of the flour. Add yeast to the indentation, making sure it does not come into contact with the liquid ingredients. 4. Insert the bread pan into your machine. Run a cycle for a 1.5 pound loaf of French Bread (or similar, depending on your machine). For us, this cycle lasted nearly four hours, so plan accordingly! 5. Once done, remove the loaf from the pan and allow to cool on the counter. Enjoy a warm slice or two while you wait! 6. Preheat the oven to 425 degrees F (optional). 7. Slice the loaf either length or width-wise, taking off only as many slices as you need. A single thick slice makes for a decent meal, but a hungry vegan can easily down two in one sitting! One loaf should be enough to serve three to five people (or one or two with plenty of leftover bread for snacking!). 8. 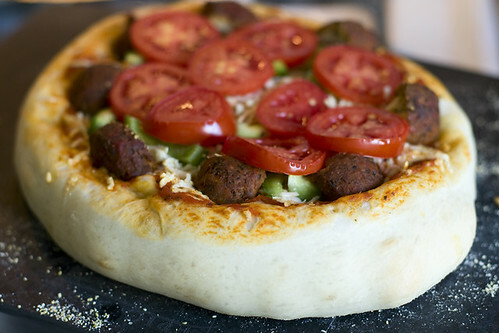 Garnish with the pizza toppings of your choice – sauce, nondairy cheese, vegan meat, fruit, vegetables, nuts, etc. – and cook at 425 degrees for 20 minutes or until the bread is toasted and the cheese is melty. For a single slice, save some energy by using a toaster oven! Posted: 05/31/11 at 3:21 pm. Filed under: Food & Recipes. that’s interrupted only by a thick white stripe of fur that runs up his belly, chest and face. His beautiful brown eyes gaze engagingly at the camera. Photo courtesy of Olive’s Hope Pet Rescue. Buddy is in search of a buddy! This cute pit bull terrier/boxer mix needs a home to call his own. Listen up, ’cause this is where you come in! Buddy could be a pit or he could be a boxer mix. We can’t be sure, but he is one of the sweetest dogs I have ever met. He loves to play with other dogs and is submissive. Buddy is crate trained and knows how to sit. Please give this darling boy a forever home! Buddy is currently staying with Olive’s Hope Pet Rescue in Louisburg, Kansas, which is about 45 minutes south of KCMO – a straight shot down I-69. Just a 90 minute round trip to find true love, and you can even pick up some bitchin’ apple cider while you’re down there, too! IT’S A WIN-WIN, PEOPLE! DO IT FOR BUDDY! Posted: 05/27/11 at 12:25 pm. Filed under: Find-a-Friend Friday. Five tiny little kittens – brothers and sisters – need your help! Spring these innocents from jail, won’t you please? Photo courtesy of the City of Osawatomie Animal Control. First up is a litter of five kittens (pictured above) who have the unfortunate luck of beginning their lives at the City of Osawatomie Animal Control. Not that Osawatomie isn’t a lovely place, but the pound is no place for youngsters now, is it? (Or adults for that matter, but still. KITTENS! They’re just BABIES!) And as Osawatomie AC points out, “I’m in a fight for my life. This pound serves several towns so the space is always a pressing concern.” Nope, no way to spend your childhood AT ALL. We don’t know the sexes of all of these kittens, but the three torties are most surely female. These are just babies and need new homes right away! I’m in fight for my life. This pound serves several towns so the space is always a pressing concern. This cat is so friendly she walked through her water bowl because it was the closest route to where we were standing! She needs rescue ASAP! I’m in fight for my life. This pound serves several towns so the space is always a pressing concern. Osawatomie isn’t that far a drive from KC, people! Just an hour south of KCMO! Half an hour if you’re already in Olathe! You would do anything for love, yes? Well then! Last but not least is a listing a friend asked me to pass around. Prissy is a deaf cat located in Murray, Kentucky. Before you let this girl’s “special needs” scare you off, go talk to Deb of Invisible Voices (“a friend” of the previous sentence), who herself is a guardian to a deaf cat, Jake. While it’s true that living with a deaf nonhuman requires special considerations, including nonverbal means of communication, deaf cats are every bit as deserving and capable of forming loving relationships with others! This cat was found and kept for awhile by the person who found her. She is scared and is DEAF. She is mostly white with a smudge on top of her head. She needs some TLC. Update: Prissy has been with us for 2 weeks as of 4-14-11 and is doing much better. Her coat is sparkling white now, she is much more people-friendly and her personality is showing well. She would prefer a home without other cats, but may be okay with a very careful introduction. She would do best in a home without smaller children because she startles easily due to her deafness and can get overstimulated. She is a playful cat. Indoor only home due to her deafness and being white. Prissy is currently staying at the Murray/Calloway County Animal Shelter in Murray, KY. Even if you’re unable to adopt any of the lovely felines featured here, please spread the word! Forward their listings to friends in the area, share them on Twitter, and “like” them on Facebook. You get the idea! A little bit of networking may be the difference between life and death for these cats. Please help however you can! Posted: 05/20/11 at 12:37 pm. Filed under: Find-a-Friend Friday. 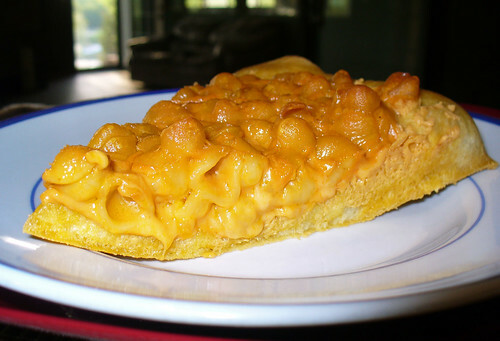 Recipe: Creamy Vegan Mac & Cheese Pizza! This recipe is pretty simple and straight forward: make your dough, roll it out, top with your favorite mac & cheese dish – and bake. Voilà! 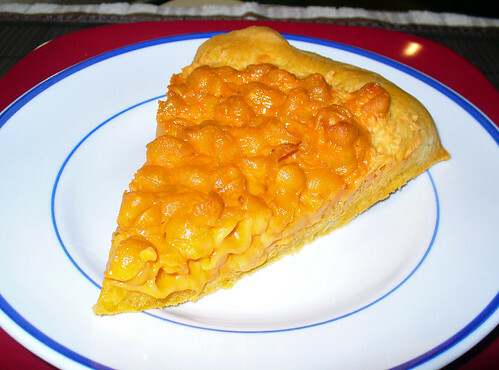 Mac & cheese pizza in its truest form! The verdict? Delicious and VERY FILLING. 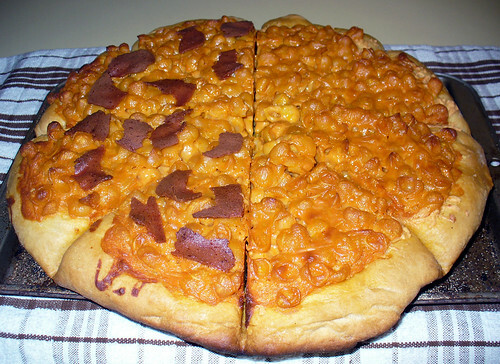 Surprisingly, this isn’t my favorite pizza concoction, not by a long shot. Methinks it comes in third, right after the aforementioned Cheesy Vegan Tater Tot Garbage Plate Pizza and Vegan Bacon & Cheddar Double Potato Pizza. Note the common theme: CHEESY and CARB-A-LICIOUS! Veganism = deprivation, says who? Creamy Vegan Mac & Cheese Pizza! FYI: this is my recipe for Creamy Mac & Cheese with Daiya and Follow Your Heart vegan cheeses, halved; follow the original recipe if you’d like some extra mac & cheese to serve with that mac & cheese pizza – or if you’d just want the mac & cheese, please! For a healthier pizza, sub in a mac & cheese recipe that uses a nutritional yeast sauce. 1. Stir the water, sugar and yeast together until dissolved. Add the olive oil and salt, as well as any extra spices or seasonings. Stir in the flour until blended. Form the dough into a small ball and let rest in large bowl, covered loosely with a towel, anywhere from 30 minutes to two hours. 2. Once the dough is done rising and you’re ready to assemble the pizza, get to work on the cheese sauce. In a medium-sized saucepan, bring the soy milk to a boil. 3. Reduce the heat to medium and mix in the margarine, stirring until melted. 4. Add the cheese shreds, stirring gently until they combine with the liquid to form a creamy cheese sauce. The soupier the better, as the oven baking will thicken it up quite a bit. Optional: season to taste with salt, pepper, onion or garlic. 5. Reduce the heat to low, stirring every few minutes. Combine the two to make mac and cheese! 8. 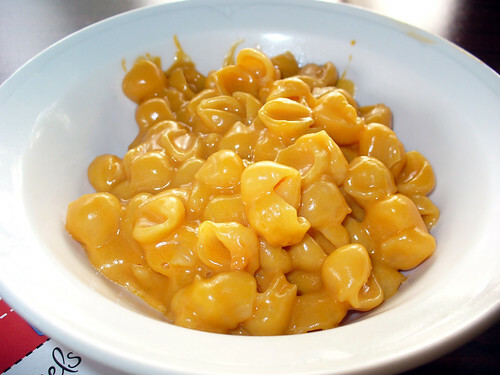 Mix the cheese sauce into pasta, stirring well. On medium low heat, let the pasta continue to cook until it’s the desired consistency. Stir constantly during this last step so that none of the pasta or cheese sticks to the pan. 9. As the pasta is cooking, spread a dusting of cornmeal onto your pizza stone (or lightly coat your pizza pan with cooking spray). Using fingers dipped in olive oil (optional), pat the dough onto the stone, spreading it out evenly. Lightly dust a bit of olive oil on top of the dough, or spray it with a bit of cooking spray. 11. Bake at 425 degrees, for between 15 and 20 minutes for a single pizza, or 30 minutes for two pizzas. 12. Serve warm, perhaps with a side of macaroni and cheese for dipping sauce? Okay not really. This is my serious face. You do not kid about mac & cheese. Posted: 05/16/11 at 11:04 am. Filed under: Food & Recipes. Saturday Garbage Plate: By the Power of Pizza! CC image via flickr user theamarand. Friday: Deep Dish Pizza, A Photo Essay from what the hell _does_ a vegan eat anyway? Contests and giveaways! So Delicious is still going strong with its 100 Days of Change Giveaway. Today’s prize? A sterling silver Kate Spade picture frame – perfect for showing off that kickass pie you made last week. Enter to win on their FB page. Elsewhere on the interwebs – and in honor of World Fair Trade Day (that’s today!) – Luna & Larry’s is giving away one Coconut Bliss gift basket. Spay & Neuter Kansas City is having a rough week, y’all. First Jackson County decided to cut the org’s funding, and then several air conditioning units were stolen right off the roof of the shelter! If you can, please consider donating your time, money or goods. Also download and share its Spring 2011 newsletter “The Scoop” to help spread the word about all the great work SNKC’s doing! This week at Animal Haven: Baxter’s Boutique is open for business; read about young volunteer Beth Gasser, who donated a gift basket to the shelter as part of her Bat Mitzvah celebration; and meet (read: adopt!) Shilo and Achilles! Get high – on life, on carbs, whatever – and watch this video. It’s weird and scary and I die a little inside every time I see it, and yet I cannot turn away. Posted: 05/14/11 at 1:37 pm. Filed under: Saturday Garbage Plate.